Short, yellow hair. Average height. Eyes that never seem to blink. Always stands tall. Always dressed far better than anyone around. An air of menace surrounds him and leaves everyone nearby on edge. Never without a pair of humans that look like animals next to him. There was no doubt in Seren’s mind, it was her uncle. There were other things that this Elf had said to get her attention, but those were the important points. Those were the things she remembered. Thirty paces behind the Elf, Seren tried to decide what she was to do. Drak and the other members of the local Thieves’ Guild would be expecting her back soon. If she was too late, they’d likely suspect something. Not that this would be anything new. They were always paranoid, but it would be best not to give them any more reason to be difficult. Red tunic. Light hair. There. She had nearly lost him, distracted by her own thoughts again. It was something she fell into far too often. Seren knew that she had to focus, especially now. He was looking for something. Looking over his shoulder a moment, almost right at her. So he was paranoid, too. Another detail Seren knew she should have picked up in listening to him talking in the tavern. Of course he was paranoid! His voice was nearly shaking when he was telling the story of her uncle to some other patrons. Why hadn’t she considered he might be constantly looking over his shoulder?! Focus on the moment. Pay attention. 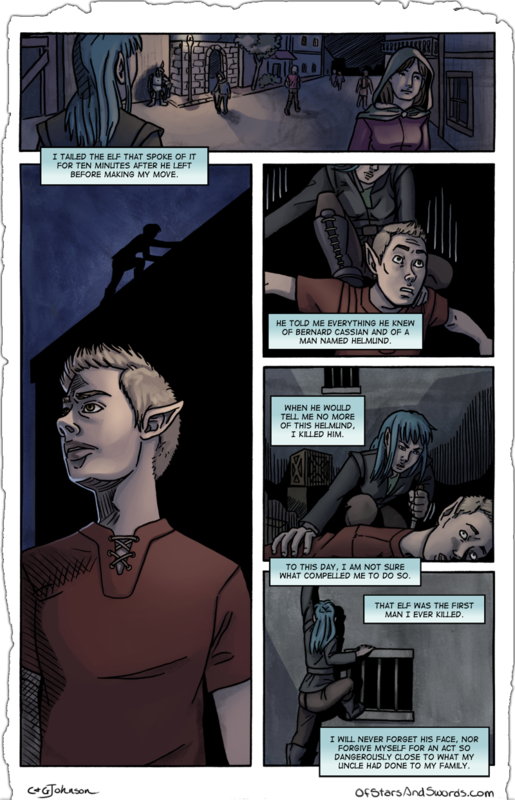 Before the Elf could have a chance to look around again, Seren ducked into a narrow alley between two buildings. Her eyes scanned the dark, cramped area before focusing on the brick work that held one of the buildings together. It was sloppy, and that meant it was easily climbable. Taking a deep breath, Seren swore to herself she wouldn’t look down and found the nearest slightly-protruding brick. In moments, she was halfway up the wall. While she might have been terrified of falling, Seren knew she had to move quickly or she was going to lose him. If that happened, she’d be up on the roof of a building with no real reason and nothing to show for it save for the need to get back down. Upon reaching the roof, a new problem presented itself. The building’s roof was not flat, as most were, but a gentle slope. Clay shingles lined it, and suddenly Seren was reconsidering the viability of this idea. But no. No, she was already here and he could easily have escaped her by now. Adapting to the environment she found herself in as best she could, Seren stayed low, climbing horizontally. She moved quickly, but took great care to find the firmly placed shingles so as not to send any tumbling to the ground below. But he wasn’t there. No red at all. She could see far enough that, unless he’d started running or ducked into a building, there was no way he would have gotten out of sight. Where was he?! Gods, she should have known not to let him out of her sight! That was an childish mistake! He hadn’t even noticed her before! Below her, Seren heard the distinct, echoed sound of clay shattered on the ground. In the relative silence of the night, it was light a crack of thunder. Her eyes went wide. Somehow, Seren’s eyes went wider. It was him. That voice was too distinct. Faint, yes, but he was near. Other side of the building? As carefully as she could, this time taking extra caution so as not to make another mistake, Seren crawled over to look down into another, slightly wider, alley on the other side from where she’d climbed up. And there he was. Ten paces into the alley, he was turned and looking back towards the street, leaning to get a view of the source of the sound but clearly afraid to be seen in the process. Soon, though, he gave up, looked around and up, then started running down the alley towards another street. Had he seen her? No. No, he looked the other way. Not at her. Running. He was running! She would lose him for sure now, stuck on this precarious roof. Something took a hold of Seren then. All of her life, fear had been her enemy. Fear of her uncle, fear that her father had not been real, fear of being alone…and fear of heights. But now, for the first time, her fear had come face to face with the only connection to her uncle she had ever found. If this Elf got away, she might lose it forever. The word was whispered so quietly that Seren herself didn’t realize she had spoken it rather than simply thinking it. As she spoke it, Seren got to her feet. She could balance. She was good at that. She could do this. She would. After one final, steady step on the shingled roof at her feet, Seren leapt two stories down.